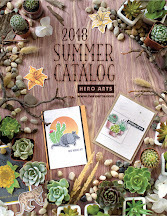 Today I am part of a fun blog hop between Hero Arts and Marvy Uchida. Marvy graceosly send us some of their products and paired with the Hero stamps it's march made in heaven. For my card I used the new Ice Fishing set and dies. 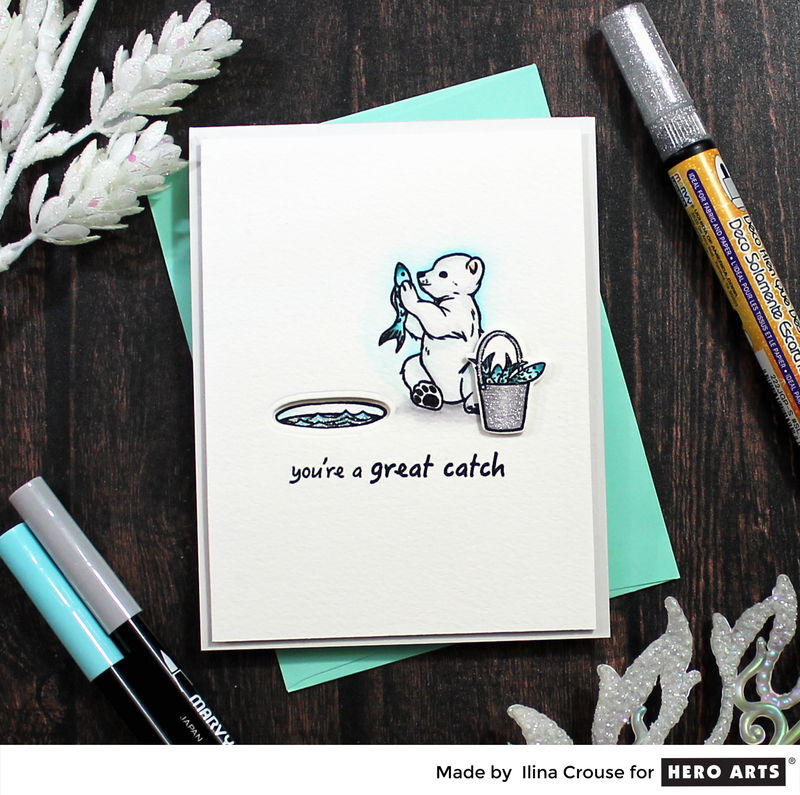 To make the card start by stamping the bear onto watercolor paper using waterproof ink, such as the Hero Arts intense black ink. Stamp the bucked and the ice hole separately and color the images using the Marvy Uchida brush lettering markers. Die cut a hole onto the main panel, to fit the ice hole and the bucket of fish. Add Marvy Glitter pen to the bucket. Once done, stamp the sentiment and assemble the panel. Adhere to light gray note card. 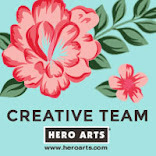 Prizes: Comment for a chance to win one of two prize packs, one from Marvy Uchida and one from Hero Arts. You need to comment by Sunday 10/21 11.59PST. This is such an adorable card! :) That little bear is so cute. I love your cute bear. I like how you highlighted him in blue, it just makes him pop!! Your ice hole looks so real!! Amazing!! Excellent card!! This is super cute. I just love the ice hole, you made is looks realistic. Thanks for sharing. Fun,cute card image. Great colours, enough to give a total snow, I've cold feeling. Cute little bear. Simply delightful! Love the colors! Lovely card! I didn't know they made a glitter pen. Thanks for sharing new products. Aww. 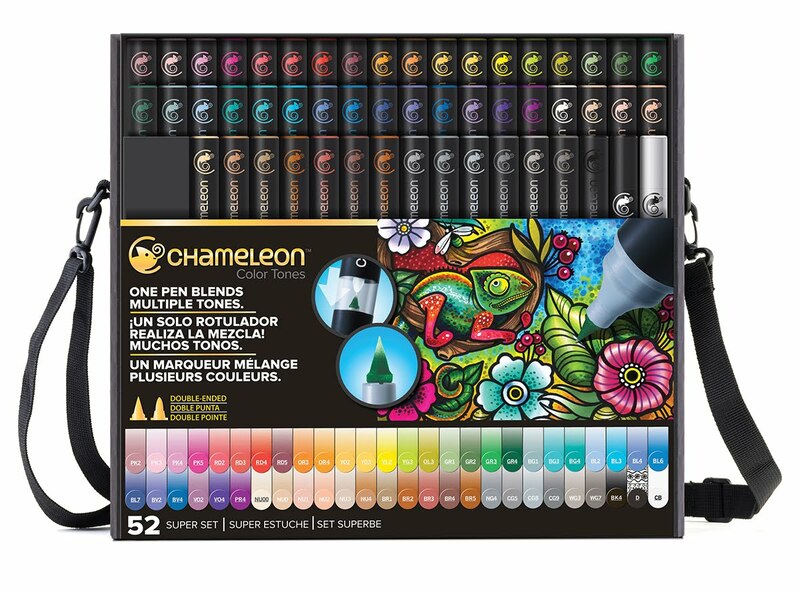 Been looking for real color pens. Maybe these? Adorable card. Thank you for sharing. I had no idea marvy made glitter pens! I must own them all!! I like the use of white space with little pops of colour and shine. Such a sweet little scene! Love the stamp and markers. These animal cards are hard to beat. They touch the heart. Love the minimal amount of color you used. With a touch of glitter, this makes an attractive card to get in the mail. I would like to make something like this for a Christmas Card. So cute. What a great CAS card! I love the silver bucket and the coloring of the bear! So glad that you are using these markers as they have been totally forgotten by me! Beautiful colors! Thanks for sharing! Very sweet card, adorable sentiment. Such a sweet card. Very cute. Adorable card! Love the sentiment with this cute image! Love the simplicity of this card, and it’s so sweet! Great idea to cut the hole in the ice. Such a cute card and the shine of the bucket is great, love those glitter pens! 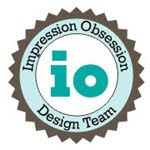 Thank you for sharing this great card Ilina. What a clean and beautiful card. It really pops off the page with the coloring. Excellent! What a great card! Really like the color you used! This ice fishing set is on my wish list for the near future. the fishing bear is darling. How cute it this card!! The fishing bear is adorable. I love it! Thank you for sharing. What an adorable card!!!! I love that fishing bear! What a sweet card and the die cut fishing hole is such a fun idea! Sweet, adorable, clean card. Love it! A really fun card! Like the simplicity! These images are adorable and your scene on this card is lovely. Thanks for the inspiration. Adorable and fun card! These markers are awesome. Oh my gosh! I laughed out loud when I saw that cute stamped image of the bear with the fish and that sweet sentiment. The ice hole looks realistic and the glitter marker added to the bucket adds that needed metallic look. TFS. Such simplicity and so, so cute. Even though the image is small, its simple statement fills the card. Gorgeous card Ilina, so simple and so cute! What a sweet little bear. The ice hole looks real. I love this adorable card and I didn't even know that Marvy made a glitter pen! So cute! Thanks for sharing your work! This is just such a sweet and adorable card! Unfortunately for me I now have even more items added to my "never ever gonna end" wish list!! LOL!! This card is super cute. I love your ice fishing hole and the bucket looks fantastic! Oh my!!! It's totally sweet and cute!!! Love it!!! Beautiful card! I really love the glitter on the bucket! I also love how you have the ice fishing hole cut out to really resemble a hole! excellent effect! 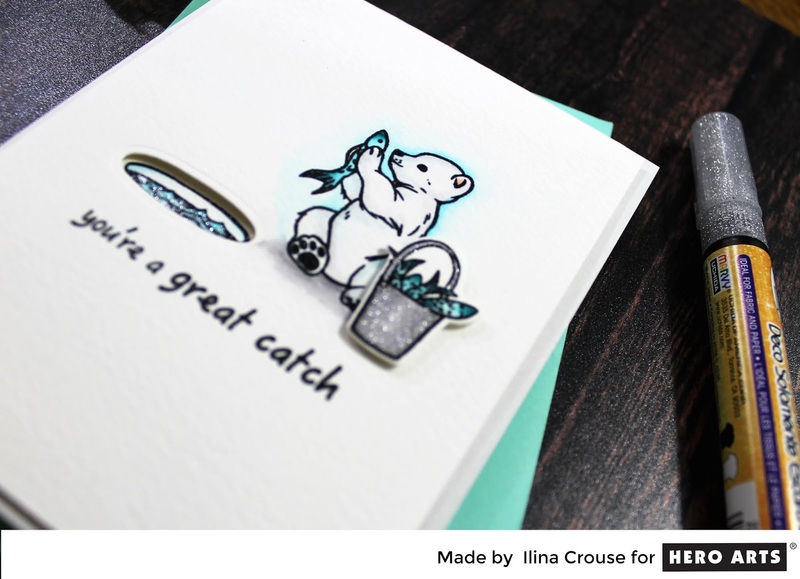 Oh Ilina, this is so sweet, it would make a perfect birthday card for my husband who LOVES to fish and has a Dec. birthday. Thanks for the great idea! Love your card and that cute bear stamp. Great design! Very cute scene. I like the minimal coloring. That bear is adorable. I love the soft colors you used. Cute card, the bear is so sweet! Love the colors used on this card. Super cute card! 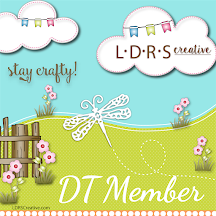 Love the clean design and sweet scene you created. This is so sweet and great coloring. The polar bear is super cute! Cute card llina! Love the little bear. Nice card! Love the clean design! The blue highlighting is genius! I like the depth you got with the ice hole. Great card! This is such an adorable card! That little bear is so cute. Love the cards simplicity. Beautiful card! I love the bear! Thank you for sharing! I hope I don't post twice. The page refreshed so I am not sure if my first comment posted. This is such a sweet card. I love the little bear. 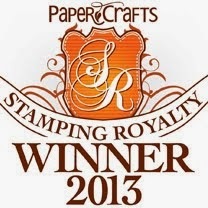 What an adorable card - love the colors and this stamp! Super CUTE ice fishing bear! Adorable card design...sweet and simple with just a hint of color. I love it!